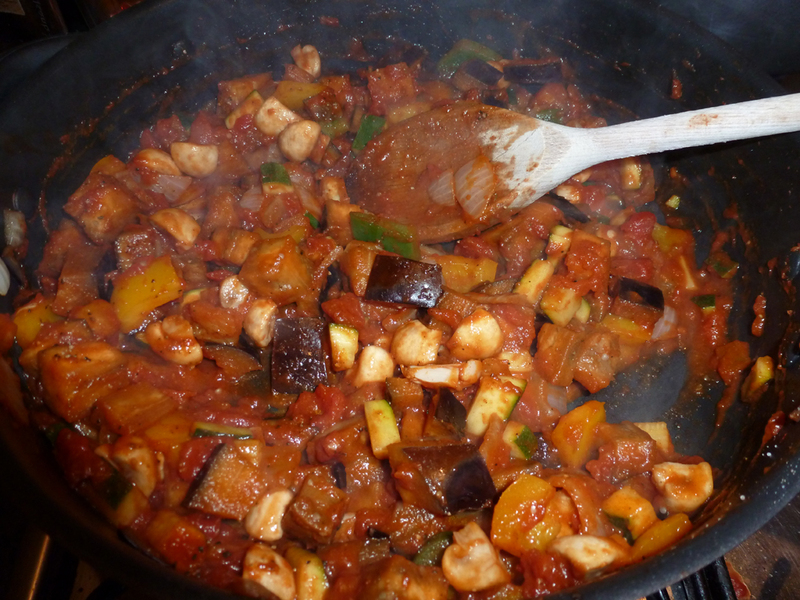 Ratatouille is one of those things that I've often made but I've never actually followed a recipe. My general method is to chop up lots of whatever mediterranean looking vegetables I can find in my fridge, bung them in a pan to fry for a while, pour in some tinned tomatoes, a couple of Knorr chicken stock cubes and a tin or two of chopped tomatoes et voila. Ratatouille. It has a runny yolk! Today, I learned to make it Gordon's way. And I wasn't too wide of the mark until it came to seasoning. He doesn't use Knorr! Or any other kind of stock. Just some smoked paprika and cumin, a little garlic, some chilli, salt and pepper. A complete revelation! In fact, I'm not sure I can remember the last time I used a stock cube (except when making soup) whereas normally I bung them into everything (savoury!) to add flavour. The other thing that surprised me was how little 'sauce' the ratatouille had. He suggested adding just 250g (slightly more than half a tin) of chopped toms to the mixture. I ended up using the whole tin as I had quite a large aubergine and added some mushrooms as they were kicking round the fridge and I was a little light on the bell pepper front. In fact, it very nearly simmered dry before the veggies were soft, but in the end, it was so much nicer than my usually 'wet' version. Despite the lovely, Spanish aroma emanating from the pan, it had to be seasoned within an inch of its life with salt and pepper to compensate for the blandness of the vegetables. I've noticed that 'sleb chefs use an inordinate amount of seasoning when they're on the telly. Is this because their food is really tasteless??? My biggest success today was getting a baked egg to have a runny yolk. I watched the clock like a hawk and then gave it an extra two minutes because I don't have a flat-ish oven proof dish suitable for this (I think he used something like a sabayon dish) hence, a couple of extra mins for my deeper dish. This made it really hot when trying to eat it and I now have a burnt tongue but it was a passable, reasonably healthy meal - I had it for tea, but most people would probably see it as a light lunch. Using the rest of the ratatouille for lunch for the next couple of days, but I think I'll keep looking for a better recipe that needs less salt and pepper. Heat the oven to 190C. In a large frying pan, heat the olive oil over a high heat, then add the onion. Saute for 2 minutes, then add the aubergine and pepper, crush in the garlic and fry for another minute. Add the courgette and saute for another 2 minutes. Add the cumin, paprika and chopped tomatoes and give it a good stir. Bring to a simmer and cook for 8-10 minutes until the vegetables are tender, stirring every so often. Test and adjust the seasoning. Divide the ratatouille amongst four shallow oven proof dishes. Make an indentation in the ratatouille with a spoon and then crack an egg into each one. Bake for 8-12 minutes until the egg whites are set but the yolks are still runny in the middle. Serve immediately with some french bread.